Trinity College was founded by Henry VIII in 1546 and amalgamated two 14th-century colleges, Michaelhouse and King's Hall. 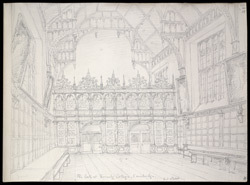 Thomas Nevile, who became Master of Trinity in 1593, was responsible for building much of the new college. The Hall seen here dates from this time and boasts a magnificent timber-beamed ceiling. A portrait of Henry VIII by the great painter Holbein used to hang here but has now been replaced by a reproduction. Past alumni of Trinity College include the philosophers Francis Bacon, Bertrand Russell and Ludwig Wittgenstein; poets John Dryden, Lord Byron and Alfred Lord Tennyson; scientists Sir Isaac Newton and Ernest Rutherford, and writers William Thackeray and Vladimir Nabokov.